You’ve probably seen it or heard it. “I’ll take a roll of the orange waffle.” You’re probably thinking “orange waffles” at a tile store. What’s that about? It’s about uncoupling membrane. 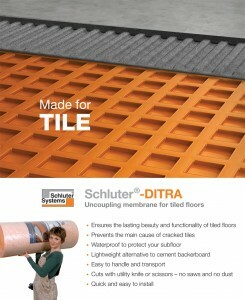 To be precise, it’s Schluter System’s DITRA uncoupling membrane. Packaged in rolls, it has a waffle like pattern and, you guessed it, it’s orange. Great! Mystery solved, but what does it do and why would I want this? In Europe, you may find old buildings with original tile floors that are in perfect condition. Those floors were most likely installed using the very first uncoupling system. The installers first created a mortar base followed by a layer of sand and finished with another layer of mortar in which the tiles are installed. Basically, this created a “floating” floor. This would allow for some degree of subfloor movement as the building settled. While this system worked great, it added a substantial thickness and weight to the flooring and was time consuming. Today, many tiles are bonded directly to the subfloor. This method of installation did not create additional thickness to the floor, but any movements were transferred directly to the tiles and grout, causing one, or both, to crack. With DITRA, the tiles are uncoupled from the substrate, allowing for lateral movements. 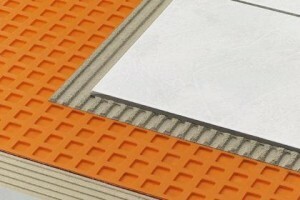 The felt side of the membrane is bonded to the substrate and the tile is bonded to the “waffle” side of the membrane. When viewed from the side, the pattern is similar to a dovetail joint. 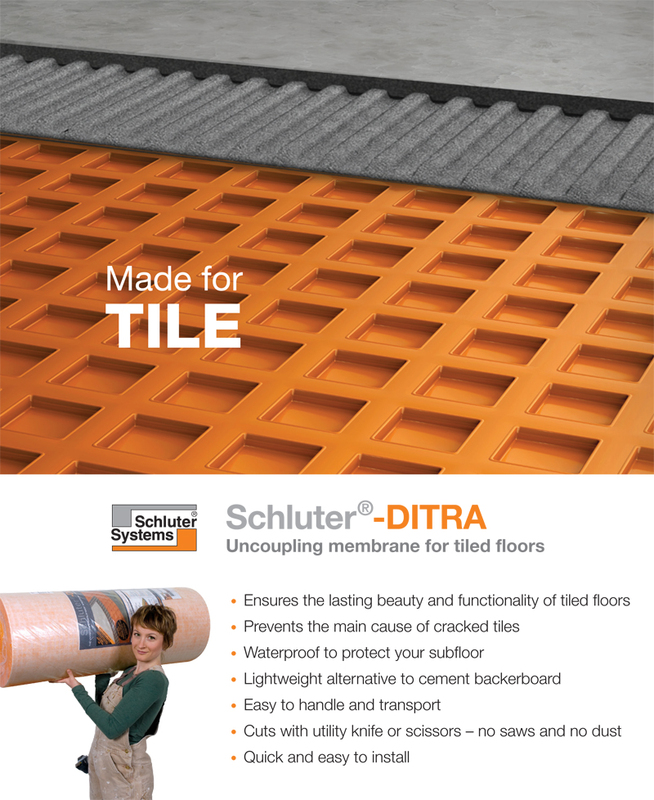 And with the use of Schluter System’s KERDI-BAND, it becomes a waterproof membrane. So the next time you hear someone mention “orange waffles” at a tile store, you know it’s not some secret tile setter’s snack, but the secret to why some tiled floors don’t crack. As a Schluter System Authorized Dealer, we stock all three sizes of DITRA: 54 square feet, 150 square feet, and 323 square feet.